At Varbros, LLC, customers have counted on us for over 50 years to provide exceptional quality stampings and assemblies. We offer stamping services with a wide range of stamping presses, handling anywhere from 100 to 1,000 tons. 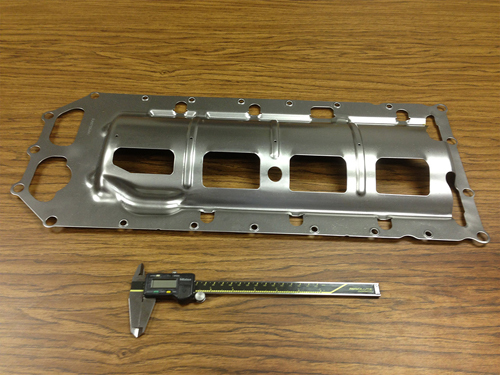 Our stamping services are available for prototypes, full production, and contract manufacturing. We supply our services to tier 2 and tier 3 companies, along with offering just-in-time inventory services. At our 118,000 square foot facility, we can accommodate materials including carbon steels, high-strength steels, pre-coated steels, aluminum, and tin plate. We stamp these materials in thicknesses that range from .015” to .315” – manufacturing to tolerances as tight as ± 0.001”. Full assembly services are also available, including high quality projection, resistance, and spot welding. We provide our stamping and assembling services for industries such as the filtration industry providing products such as nut plates, retainers, and welded assemblies. The quality of our work is demonstrated by our ISO 9001:2015 certification with efficiency programs including lean manufacturing and a Six-Sigma Green Belt on staff. 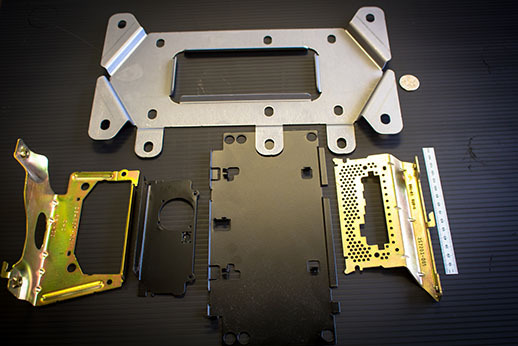 We back up our stampings and assemblies with a variety of additional services, including post-plating and coating, deburring, heat treatment, tapping, CNC machining, and more. The multiple varieties of manufacturing services we provide make us a one-stop shop for many of our customers for high volumes production. For further information about out stamping and assembly services, please see the following table or contact us directly. This method uses a solid projection in the material to concentrate the current flow at a contact point which results in lower currents, forces and process times than spot welding. A process where heat is generated by passing current through the resistance caused by the contact between two or more metal surfaces to be joined. A form of resistance welding used to join overlapping metal sheets. Two electrodes are used to clamp the sheets together and pass the current between them. Tool Builds: part dependent — typically 14-16 weeks. Production: typically 4 weeks — 6 weeks with outside services. At Varbros, LLC, we specialize in supplying the automotive, appliance, lighting and many other industries with world-class quality and cost-effective metal-stamped parts. From custom and complex prototypes to large production runs of existing designs, we have the in-house equipment to efficiently manufacture your metal stamped parts. Using single-hit dies, progressive dies, and transfer dies; we offer metal stampings of heavy-gauge to thin-gauge materials made out of many types of steels – including high-strengths, pre-coated, and aluminum grades. We offer deep draws, extruded, and many other types of stamping processes. Our metal stamping presses can provide 100 to 1,000 tons of pressure with the ability to work on parts up to 25″ in length – and widths up to 50″. 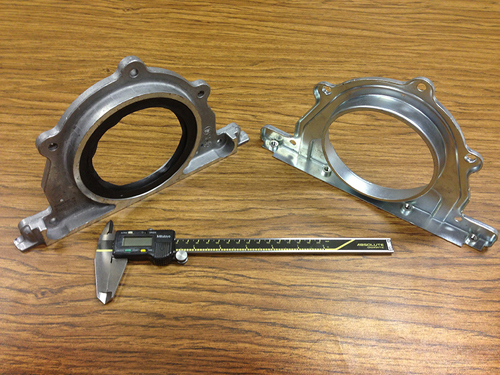 Part thicknesses can range from 0.020″ to 3/8″ and still maintain tolerances of ± 0.002″. New tooling built by Varbros and TrimLine is guaranteed for life-of-part when production parts are produced by us. We also utilize lean manufacturing principles and have a Six-Sigma Green Belt in-house. Varbros competes successfully in cost and quality with overseas suppliers by using the latest equipment technologies and by meeting its customers’ demands with competitively priced quality products. At Varbros, we are a leader in US-supplied stamped metal parts, with excellent lead times, JIT deliveries and the ability to adapt to changing requirements. See the table below or contact us directly to discuss your metal stamping needs. As a natural extension to our metal stamping processes we also have an extensive tool and die build and design service. We operate a complete tool and die shop, as well as providing CAD modeling, design, engineering, inspection and testing services – in addition to repairing existing tools and dies. We can produce several types of dies for stamping including progressive, single-hit, compound, and transfer dies. Our tooling fixtures include those used for welding, inspection, assembly and checking as well as gauges for inspection including attribute gauges that determine the accuracy and acceptability of a finished part. Tool lengths of up to 168″ and widths of 60″ can be accommodated on our in-house equipment with dies and tooling tolerances of ± 0.001″ and ± 0.0002″ for gauges and fixtures. Our stringent inspection processes – dimensional inspection, feasibility testing and in-house tooling verification – are an integral part of our quality process which includes lean manufacturing principles with an in-house, Six-Sigma Green Belt. Our quality processes also include the implementation of ISO 9001:2015 standards. As a leader in US tool and die design we provide all of the necessary functions to assist our customers with the design and manufacture of tools and dies. See the table below or contact us directly to discuss your tool and die design needs. Dies and Tooling: ± 0.0001"
Gauges and Fixtures: ± 0.0002"
At Varbros, LLC, along with our TrimLine Die division, we provide a range of in-house machining processes that are some of the most advanced in the industry. Thread chasing, contour milling, drilling, and turning are just some of the processes we provide using an extensive array of in-house equipment. We work with part diameters up to 8″, lengths up to 60″, and to tolerances of ±0.0005″ on materials such as various tool steels and aluminum. Quality and efficiency are being constantly-improved at both facilities utilizing lean manufacturing principles to increase production efficiency in addition to an on-site Six-Sigma Green Belt. We utilize computer-aided design products such as AutoCAD, Inventor, and MasterCam to assist our customers with prototyping and production design. We can produce almost any production-run volume at our two well-equipped Varbros and TrimLine Die facilities – keeping our delivery times very competitive. This also allows us to provide rush services as required. Having the latest equipment technologies in our inventory, we can compete successfully in cost and quality with offshore suppliers by meeting customers’ demands for competitively-priced, quality products. At Varbros, LLC and TrimLine Die we are a premier supplier of CNC Machining services. See the table below or contact us for more information on our services. 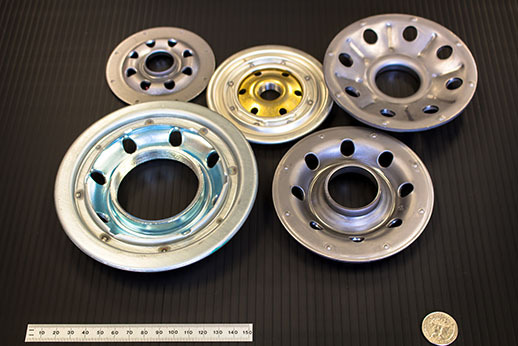 A customer in Mexico involved in the automotive industry contacted Varbros, LLC to see if we were able to help them with cost reductions on a rear retainer casting. Knowing the ability that both Varbros, LLC and TrimLine Die have in CNC machining, we approached the project at first to save time and improve the process to reduce the price in machining costs. As we looked more at the function and end use of the retainer, we started to see the advantages of being able to make this part through a stamping instead of a casting. The results from closely working with the customer and our engineering team resulted in a stamping with 60% cost savings and approx. 70% savings in weight compared to the original casting. Our Varbros, LLC and TrimLine Die team, through high production progressive stampings, eliminated many secondary machining operations. With our ability to insert clinch nuts in the progressive tooling, the team was able to reduce more costs. Through our commitment and certification to ISO 9001:2015, we strive to ensure our processes and products meet and/or exceed our customer’s requirements while still being able to maintain a competitive market position. Poke-yoke systems were put in place for this project to insure that every part was guaranteed to have 2 clinch nuts installed. We are proud to state that from over 3 million units stamped, not one assembly was returned or found with a clinch nut missing. For more information about our stamping capabilities, see the table below or contact Varbros, LLC directly. Elimination of secondary operations, i.e. 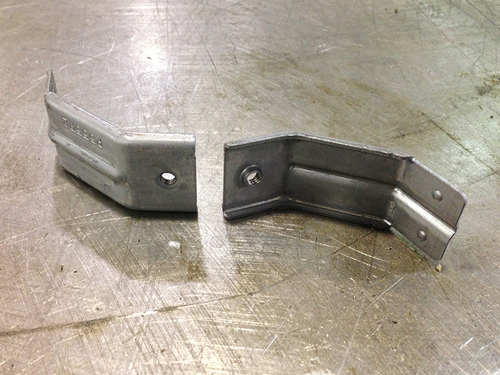 We were approached by a customer in the appliance industry that was looking for a cost-effective bracket which included a 1/4-20 threaded tapped hole. With our accomplishments for in-die tapping, we were able to eliminate any secondary operations by producing the part completely from the progressive tool. The challenges we faced were being able to run this tool at a run rate fast enough to keep our piece-price competitive. Using our experience gained from various threads used in the filtration industry, we were able to modify taps for longer runs and develop the best extruded-hole features to ensure quality threads. Thread quality is checked constantly throughout the production runs to guarantee that the quality is first class. Varbros, LLC’s and TrimLine Die’s equipment, tools, and experience allows us to run high-volume production stampings that are world-class in quality. For more details about our in-die tapping capabilities, see the table below or contact Varbros, LLC directly. In-die tapping of a progressive die eliminates the need for secondary operations. We were asked to deliver a stamping with clinch nuts installed for a program that required one million-plus units per year. The challenge was to eliminate a secondary operation of nut installation that was the bottle neck in the process. Through working with inside and outside sources, we accomplished a system that not only inserted the clinch nuts in the progressive tool but had the ability to 100% inspect both presence of the nut and also detect that all nuts installed had threads present. Along with our ISO 9001:2015 certification, our quality control procedures are second to none and ensure that the customer demands are always met. For more information on nut insertion capabilities see the table below or contact us directly. Nut insertion in progressive tooling | inserting clinch nuts into progressive tooling to make parts complete without use of secondary operations. Able to insert clinch nuts, rivets, and standoffs into progressive tooling to make parts complete off the press. No need for secondary operations or machining. 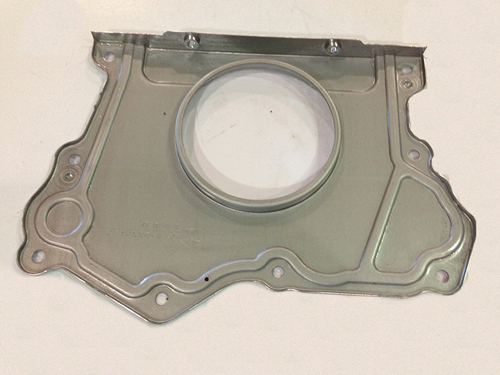 One of our larger stampings is a Windage Tray used in the automotive industry. We are able to run this stamping in our larger 600 ton press with a bed size of 168” long by 72” wide along with a feed line that can handle materials up to .250” thick and a material width as wide as 50”. The challenge with the tray was to be able to engineer inserts that we are able change to accommodate different variations of the tray to fit a number of different engine designs throughout the years. This ability to engineer changes in the tool saves large amounts of new tooling costs. We pride ourselves with working with our customers to achieve the most robust and cost effective options while continuing to supply larger quality stampings. Our largest press is a 1,000 ton Minster press with a bed size of 156” long by 60” width. We also supply larger stampings with our two 600-ton presses — both equipped with servo transfer systems used in transfer tooling to handle parts of all sizes. For more information about our stamping capabilities, see the chart below or contact Varbros, LLC directly.